no longer soley a blogger, I was now a self-published author and and a small business owner. I remember a few days prior to Release Day I was talking with my husband. 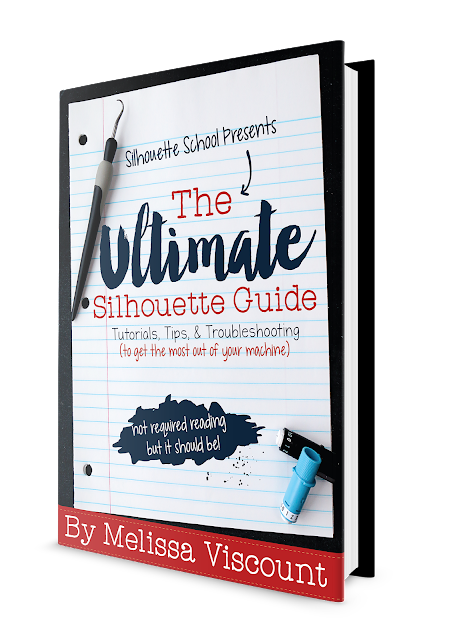 We thought we'd be thrilled if 800 people bought The Ultimate Silhouette Guide. I thought, "Wow, what if that many people actually cared enough about what I had to say - about a craft machine, no less - that they actually spent their hard-earned for the information I was sharing." Within seconds...literally seconds... I was brought to tears. My email went 'ding' and I was notified of my first sale. I can't remember the name of the first lady who bought my first ebook, but my gosh at that second I wanted to reach through the computer and give her a HUGE hug. She believed in me and the feeling was like nothing I'd ever felt. I had literally spent months - endured shingles, a wrist injury, publishing delays, the regular grinds of motherhood, and the stress of being a full time blogger and small business owner - writing this book. It really did feel like I birthed my third baby. In that moment, I could barely control the tears as I watched order after order come in - so much so that I had to turn off email notifications. This was only the pre-order period, after all. Yes, I sold an ebook on pre-order as crazy as it sounds. Why? I did it because you all asked me to do it. I honestly didn't understand, and I still really don't, why anyone would want to pre-order an ebook where the stock would never run out. But I did it and the response was truly overwhelming. During the next three day period more than 625 digital copies of The Ultimate Silhouette Guide were pre-ordered. Three days later when I fully launched my first ebook - things went to a whole new level and I've never looked back. When people make these types of comments about something you've put your blood, sweat and tears into it makes it all worth it. "Melissa, you are a godsend! Finally everything is in one place, easy to find and easy to understand instead of on a gazillion notes scattered around my craft room. I know I'll be using my Sil a lot more now. Thank you so much!" I'm happy, proud, thrilled, and humbled to say The Ultimate Silhouette Guide is now available in both ebook and paperback version - as well as being bundled with Silhouette CAMEO and Portrait machines and also available at a discounted rate when purchased with my The Ultimate Silhouette Sticker Guide! When they say a girl can dream, I never knew they meant like this. The response to my first book, was - and continues to be - such that I have gone on to write three more books. None were like my first - sure they were all shorter (two are mini getting started guides written for total beginners), but by the time I got to #2, #3, and #4 I had worked through the biggest hurdles of being a self-published author and kind of knew the territory and what to expect. Still there were challenges with each, but with each I learned more and more about writing, publishing, print on demand, working with printers, cover creation, marketing, time management...I could go on. A year ago today I would NEVER have dreamed I would be invited to speak at conferences across the country, including the All Things Silhouette Conferences. I would never have dreamed my first book would have sold more than 13,000 copies in a year. I've also never felt such a deep sense of support and gratitude from so many people I've never met - you - my loyal Silhouette School readers and for that I thank you! And just so you know this train isn't slowing down...in fact 2016 is off to a really exciting start! Two more mini guides in The Ultimate Silhouette Guide series are about to be released - details on them as soon as I can share them, an update on the original ebook will be coming just as soon as Silhouette America releases Cloud, and I have started working on two more longer format books. I'll be speaking at the All Things Silhouette Conference outside Atlanta again in November and Silhouette School Live Tutoring is off to a hugely successful start. Congratulations Melissa. You have been an inspiration and have provided me with tons of ideas and help as I navigate the Silhouette world. Wishing you all the best and continued success. It is well deserved! I love following your blog. congratulations. i just discovered you in 2015. i've had my cameo for 2 yrs now and you're my 'go to' when i have an issue with something. i just downloaded inkscape today and the extension for word wrap. i haven't figured out how to add the extension on my macbook pro. i watched your video but haven't been able to find the things you're telling me to look for. i'll work on it again tomorrow. i'm not real familiar with mac yet. Congratulations Melissa, You deserve kudos!! I received my Silhouette and I just didn't know what I had. I still don't, but thanks to you I am learning. The answers are in your books....now all I have to do is really USE my machine. These machines can do so much and the information that came with my machine just wasn't enough. The remember the booklet contained a machine diagram that was so small that I could not read it! The online manual was a little help, but without you, the silhouette school tutorial and then your books, I would have given up. Thank you. I hope others will also buy The Ultimate Guide and Sticker Book bundle! I have already paid for the first book. I just need to know where i can download it. thank you. Hi Melissa and congrats on the success. Question for you...ever a chance this new book will be released in kindle format ..? We are leaving soon on a lengthy trip...(out of the country) and I'd love to have this on my kindle. Limited in what I'm able to travel with. But this would beca perfect time to read and digest your wisdom!